I mean, come on, Gotham. You already lean into the most batshit awfulness/greatness that you can, where’s my Jada Pinkett-Smith action figure, complete with self-eye-gouging action? Oh fine, I guess I’ll have to wait. On the whole they’re not bad — although Penguin does look creepily demented in kind of the best way, compared to the relatively dour/neutral faces of Jim and Selina. Although the Jim figure does a pretty astounding job of not looking much like Ben McKenzie at all, making it basically just a “Guy in Suit” toy. I just wish there were more. I mean, Gotham is already crazy about delivering as many origin stories for Batman related characters as possible, the toyline should lean into that. An Edward Nygma that comes with a soundchip that does nothing but scream “RIDDLES!” whenever you press it? A “maybe the young Joker, maybe not?” figure? A Bruce Wayne figure that’s base is just his lifeless parents corpses, so you can recreate the Batman origin again and again and again (just like all Batman media!)? But really, I’m just in it for Fish Mooney. If one Gotham cast member deserves the honor of being immortalised in plastic, it has to be her. 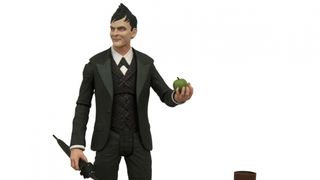 DST’s Gotham figures will set you back $25 each when they release this Fall.